CCSSO, through its Interstate Teacher Assessment and Support Consortium (InTASC), is pleased to offer this set of combined resources that both define and support ongoing teacher effectiveness to ensure students reach college and career ready standards. 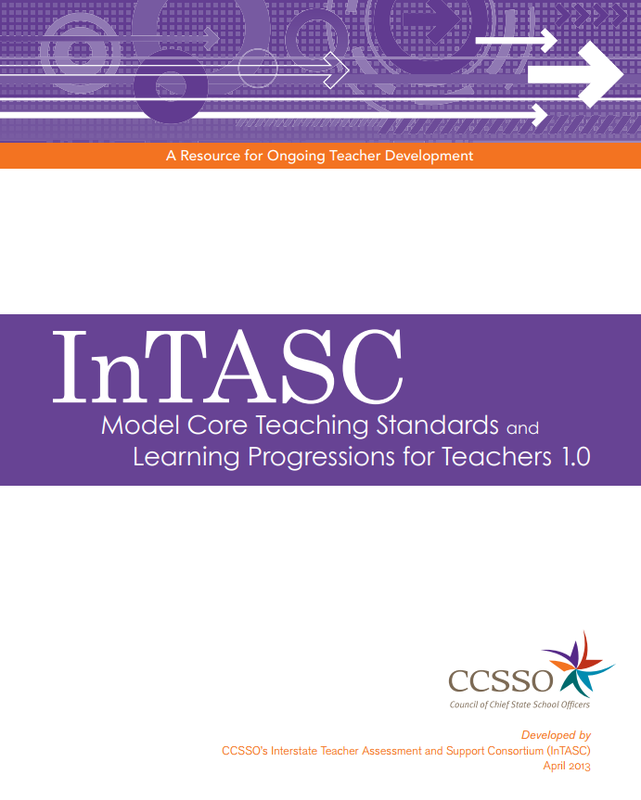 This document includes the InTASC Model Core Teaching Standards: A Resource for State Dialogue, which were released in April 2011, and the new InTASC Learning Progressions for Teachers 1.0: A Resource for Ongoing Teacher Development (2013). Together they describe the new vision of teaching needed for today's learners, how teaching practice that is aligned to the new vision develops over time, and what strategies teachers can employ to improve their practice both individually and collectively. This document is organized as follows: First is an introduction and summary of the Model Core Teaching Standards,which describe what the standards are and what they hope to achieve. Second is an introduction to the Learning Progressions for Teachers, which describe the increasing complexity and sophistication of teaching practice across a continuum of development. Third are the standards and progressions themselves, with each standard followed by its corresponding learning progression. Lastly, the document includes a glossary, a chart of cross-cutting themes in the standards, and names of committee members who drafted the standards and progressions. Our hope is that readers find this set of resources useful as we continue to refine our strategies for defining and supporting effective teaching for all learners.